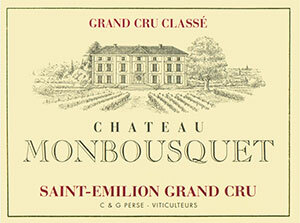 Like many of the Chantal and Gerard Perse wines, the 2008 Monbousquet is blacker than a moonless night. Like the other wines in the Perse portfolio, it is very backward, and was obviously just coming off malolactic fermentation on the three occasions I tasted it. Loaded with concentration, and perhaps even bigger than the 2005 or even the 2000, this blend of 70% Merlot, 20% Cabernet Franc, and 10% Cabernet Sauvignon topped off at 14.5% natural alcohol. Sweet, pure notes of black cherries, roasted herbs, forest floor, and toasty oak are restrained, but intense. The wine’s purity, another hallmark of this vintage, gorgeous texture, and long finish with sweet tannins as well as more acids than normal, suggest it should drink beautifully young and evolve for up to a decade. This is an incredible offering from an unheralded terroir. By the way, the 1999 and 2000 are still adolescents in terms of their evolution. En primeur barrel sample. A blend of 60% Merlot, 30% Cabernet Franc, the rest Cabernet Sauvignon and cropped at 33hl/ha, this Monbousquet has a high-toned, plumy, iodine tinged bouquet, a little pinched at the moment but with some attractive violet scents developing in the glass. The palate is full-bodied with a superb structure, weight cassis and plum-flavoured fruits, very persistent – grippy on the finish and very, very pure. It could do with just a touch more definition on the finish. Tasted April 2009.